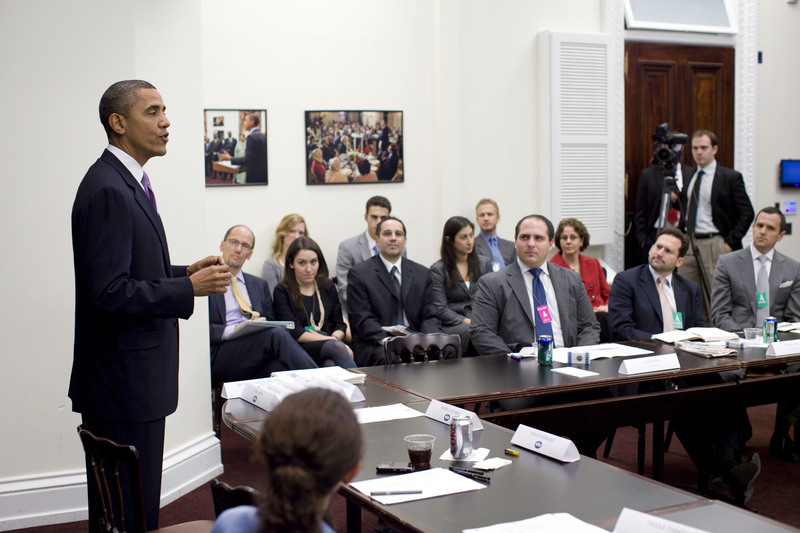 President Barack Obama drops by the Hispanic Online Summit, October 29, 2010. (Official White House Photo by Pete Souza). On Sunday, 60 minutes aired the first one on one interview with President Barack Obama after his party’s debacle in the most recent election. Questioned by Steve Kroft, Obama acknowledged he might have lost his “mojo” and let his adversaries define him and the narrative of the first two years of his administration. Obama later went on to address how media and people in general have criticized his appearances in shows like The Daily Show, The View or America’s Most Wanted. But behind this, he said, is an effort to reach those who don’t consume regular news media. It is no news that Democrats running for office failed at taunting what they had done in the past two years, something that even president Obama found himself guilty of. Let’s remember that during the campaign the then-candidate proved to be resourceful when it came to reaching out constituencies through the array of social media on the internet. But after two years the campaign seemed to have gone awry and was perfectly nullified with the conservative agenda. To fight back, team Obama was getting ready just a few days before the electoral downfall—they were probably aware of what was in store for his entire agenda—. In the weeks before Election Day, the Obama administration set at least two Online Summits with minority bloggers. The Friday before the election, the White House First Hispanic Online Summit convened to hear about what the administration had done so far in education, economy, health care and other areas. It was an encounter that had to happen. And when it happened, most of it was off the record! In a brief appearance, President Obama star-struck most of us but I could gather the sense of need the White House has to better outreach the Latin@sphere. Two years too late, some may say. But with his presidency at stake, it was about time for us to sit down and hear there’s a will to share information and optimize the translation of materials Spanish-speaking people may need to keep with what the President is doing amidst the bipartisan tragedy we’re stuck with. Representatives from Telemundo, Yahoo!, Terra, AOL Latino, Batanga, Latina Lista, Latina Magazine, Impremedia, Latinum Network, Hi5 and Nuestra Voice were present. This entry was posted in Commentary and tagged current affairs, democrats, elections 2010, Hispanic, Latin@sphere, Obama, republicans, White House. Bookmark the permalink. Nothing was “nullified” in Obama’s first two years: he got his bogus “stimulus” passed, which was bribe money to Democrat constituents and not true economic stimulus, and he got his socialized medicine passed over the objection of a majority of Americans who know that the old system is the best in the world and no government bureaucracy could ever approach its effectiveness. Obama was also free to apologize for America around the world for two years, and he took every opportunity to do so. Republicans could do nothing to stop this man from pursuing his global Hate-America Tour. So now the voters have punished his party severely, not because of his failure to sell his tainted goods, but because American’s know bad ideas and bad policy when they see them. He only won the presidency because of George Bush fatigue. Obama’s entire agenda has been clear from the beginning, and the fact is America does not want it – any of it. The hallucinations of the 2008 election are over, and a sober view of this America-hating man makes clear what he is and what he is about.